By Elise Franco | January 9, 2012 at 12:20a.m. Chloe Baer, 2, and her father Matt Baer, of Poland, log Chloe’s healthy eating habits using her An Apple A Day tracking tool. 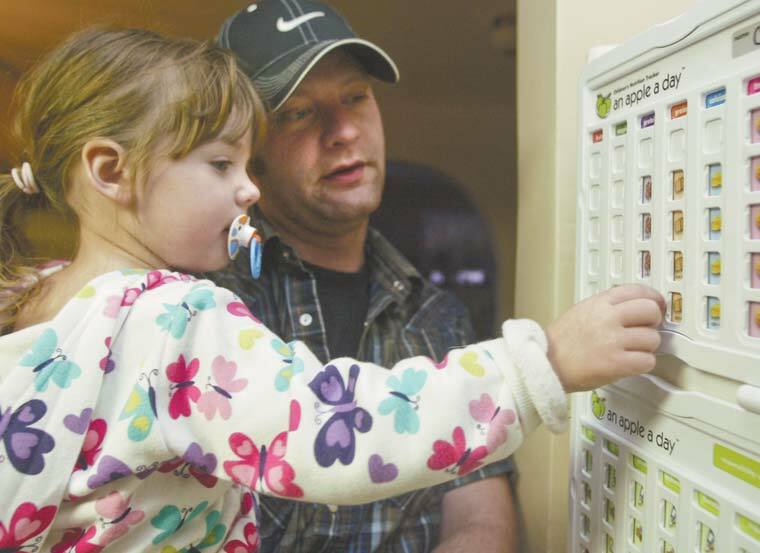 Baer said the program, which he also uses with his 7-year-old daughter, Brianna, helps him keep track of what his children are eating and gets them involved in their own nutrition. As the old saying goes, “An apple a day keeps the doctor away,” but for many young children it could also mean the beginning of a healthier lifestyle. An Apple A Day is a nutrition and responsibility tracker designed to teach kids healthful eating habits at a young age, said co-creator David Cagigas, of Cleveland. Cagigas, 39, a former Poland resident, and his sister Lisa Cagigas Johnson began developing the product more than three years ago. What they came up with is a magnetic board that hangs on the refrigerator and tracks the daily intake of fruits, vegetables, protein, calcium, treats and activity. Under each listed category is a series of doors that the child slides open at the start of each day. As he or she eats from one of the groups throughout the day, they slide the door closed, until the serving amount for his or her age group is met, Cagigas said. Sara Baer, of Salem, purchased An Apple A Day for her brother-in-law, Matt Baer, of Poland, to use with his daughters, Brianna, 7, and Chloe, 2. Baer said the tracker is the perfect way for Matt, a single father, to keep better track of what his children eat. Matt Baer said they’ve been using the tracker since Christmas, and though Chloe and Brianna are still getting used to the tool, it’s already making a difference. Baer said this isn’t his first crack at healthy eating with his daughters, but so far, An Apple A Day is working wonders. “So many people eat from windows [fast food] because it’s a convenience, but now we cook together and have fun with it,” he said. The basic An Apple A Day kit is available for $35.95 at www.anappleaday.com. Visit the website for information about additional tracker cards. September 1, 2011 12:05 a.m.
August 16, 2013 12:01 a.m.
July 21, 2012 12:04 a.m.
September 1, 2011 12:01 a.m.